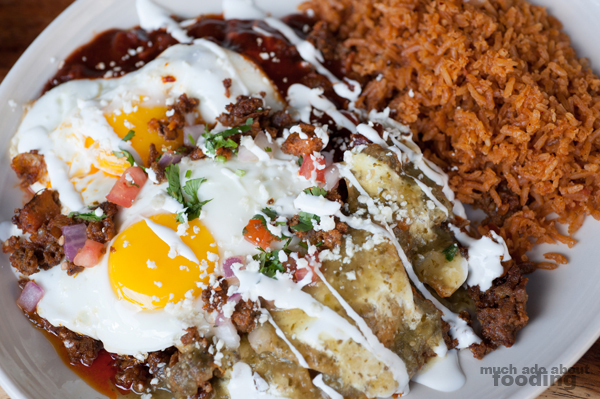 If Mexican food sounds like a good brunch cuisine to you, then we should be friends. 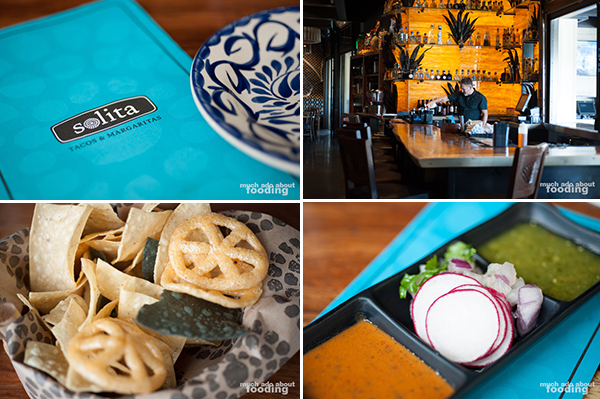 If you already like solita out in Huntington Beach, then we should really talk. Duc and I have enjoyed dropping by the sister restaurant of SOL Cocina ever since it opened; we discovered the joys of the tacos and margaritas spot and recently learned of its brunch option. 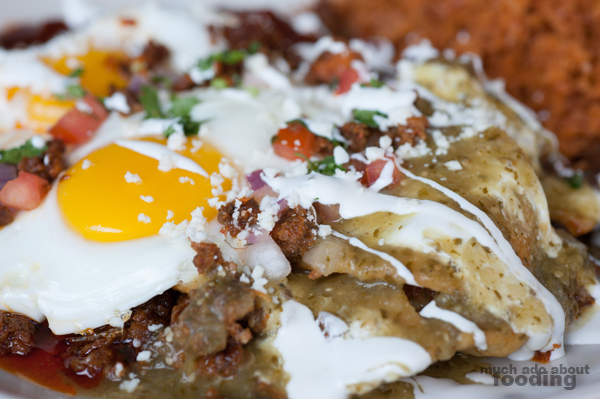 Served Saturday and Sunday from 11am to 3pm with live music at noon on Sunday, brunch features a short list of items but when those dishes get add-ons of signature proteins, they shine. We were invited in to give the weekend perks a try. This was the earliest trip we'd ever made out to solita before - other times were mainly for dinner because the entrees have always been satiating enough to be a nighttime treat. Even at this brunch hour, the general lunch menu was available to those not wanting to stick to the Mexican breakfast style, and every table still got a basket of the fresh tortilla chips and duros with Chef Deb's special salsas. As always, they were addictive. What is brunch without mimosas? solita offers different drink choices for brunch time but popular orders are for their different buckets. 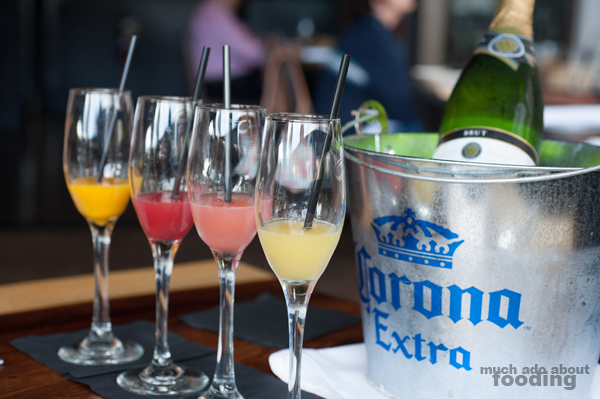 There is a Michelada bucket that is for the morning beer lovers but there is the Rainbow Mimosa Bucket ($20 - four fruit choices pre-poured and iced bottle of sparkling wine; choices of watermelon, guava, mango, strawberry, pomegranate, kiwi, or pineapple) for the brunch veterans. You should note that this does not guarantee endless mimosas though - just a series of four in the different juices you'd like to use. 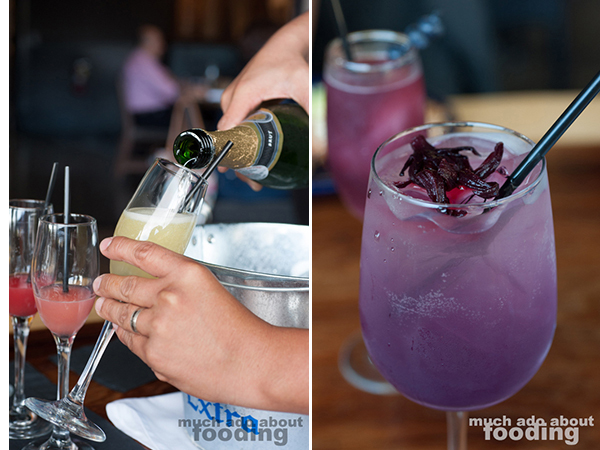 While the juices were quite refreshing and pleasantly varied, the sparkling wine was on par with other mimosa-served types. Only the juices made an impression. We then moved onto their stand-alone brunch cocktails of Sparkling White Sangria ($7 - sparkling wine and Chardonnay mixed with housemade hibiscus reduction and fruit juice served over ice) and Frozen Red Wine Sangria ($8 - housemade sangria layered over custom frozen margarita mix). I have never seen such a beautifully purple cocktail before solita's white sangria. The hue was mesmerizing and the cocktail exquisite. We also greatly enjoyed the frozen sangria though its chill level did not stay throughout the experience. 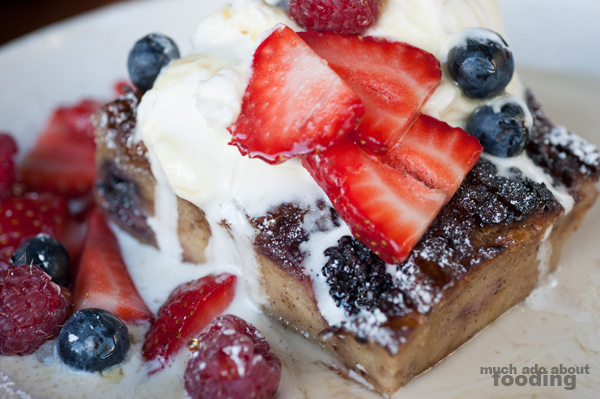 To start off, the manager actually recommended we go with the Berry Cinnamon Bread Pudding ($10.75 - sweet and creamy with brown sugar, fresh berries, and Ceylon cinnamon served warm with a drizzle of agave syrup, brown sugar sour cream sauce, and a dollop of whipped cream) for first impressions. The dish came out practically steaming hot with the saccharine smell of a doused bread pudding. Thick and moist, the bread pudding would have been overwhelming had it not been for the sour cream sauce, a slightly sweet, slightly sour accompaniment. The fresh berries were a necessary touch, and the whole dish was more dessert-like than an entree (though some do have it as a main dish!). As mentioned above, the proteins are add-ons to brunch items. You can select to add them to any entree, and they include components such as carnitas, carne asada, and even chile tofu. If you don't snag one of those, the dishes may seem plain and tortilla-heavy. We began with the Chilaquiles y Huevos ($10.75 - corn tortilla chips, onion, red or green salsa and cheese topped with scrambled eggs and served with cotixa cheese, crema, and pico de gallo served with one side) and chose to make it a 50/50 with half in green salsa and half in red. We also made Mexican rice our side dish and added chorizo for an extra $2.75 to give the dish more substance. Had we not, the dish may not have been as filling. The eggs were also served sunnyside up instead of scrambled, giving a jiggly glean to the morning. Overall, the chilaquiles were decent but we've had much better for less of a cost elsewhere. The second entree of the morning were the Huevos Rancheros ($11.75 - two corn tortillas, refried black beans, two fried or scrambled eggs, ranchera salsa, melted cheese, avocado, and cotixa cheese served with one side) with Mexican rice and roasted chicken for $2.75 more. It was explained to us a while back that each meat had a specific type of wood dedicated to being the main fuel and flavor imparter. In the case of the chicken, we chose it for the oak usage and its unique scent. Presentation-wise, the huevos rancheros were not tempting to look at but the savoriness and the robust flavor of the chicken made up for it. They definitely make a Mexican breakfast even more appealing (how could it get more appealing...?) for brunch time on a weekend. As always, the meats at solita are superb but it is a pity that they do not come standard for the brunch entrees. With a protein as an add-on, brunch dishes will range in the $14+ zone instead of the originally priced $10-12. The listing is quite small for brunch but contain some solid dishes. 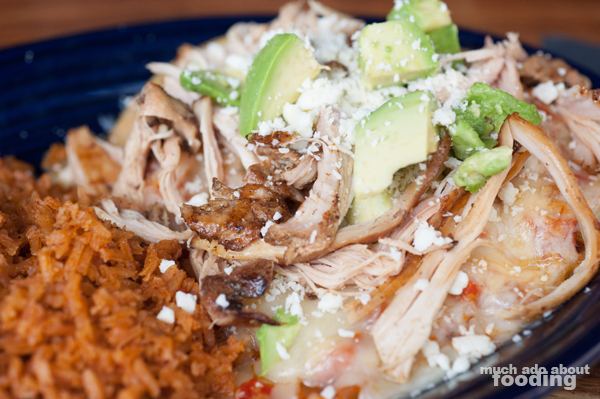 If you want to check out solita for any time (we really recommend the elote! ), they are at 7631 Edinger Avenue, Suite 1508 in Huntington Beach (Bella Terra).